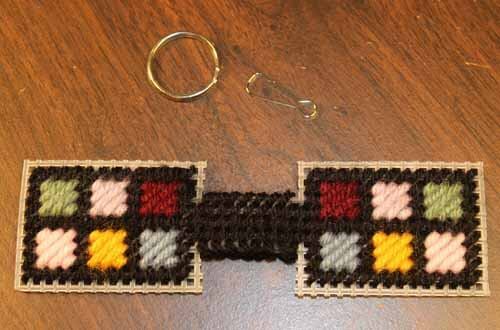 Learn how to make a patchwork key ring (zipper pull). This is a quick, easy project and is a great way to use leftover yarn from other projects. By adding a lanyard snap, it can be made into a zipper pull. 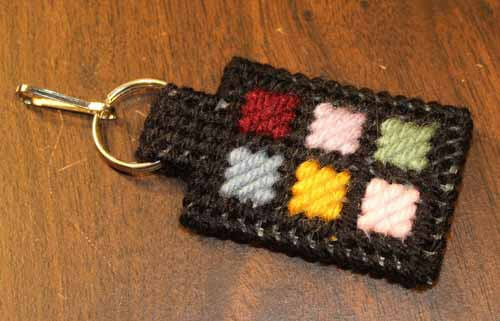 What a lovely, thoughtful gift this key ring would be for a quilting friend. 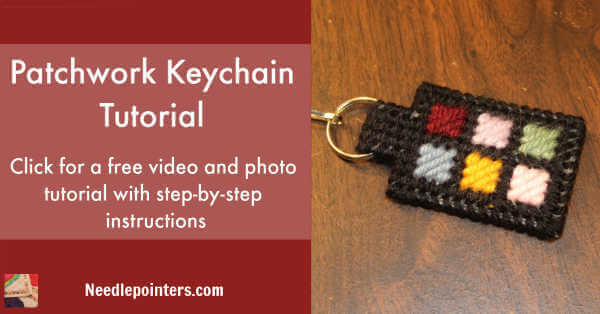 Watch this video tutorial and read the following step-by-step instructions to learn how to make a patchwork key ring or zipper pull. 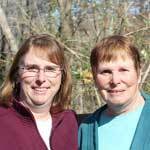 You will finds links to supplies you may need for this project at the end of this article. If you purchase supplies through these affiliate links, we will receive a small commission which enables us to continue making videos and tutorials like this one. If you would like other ideas for free plastic canvas projects, our Plastic Canvas Project page has over 100 ideas. Watch our Video Below or Click the link to watch How to make a Patchwork Zipper Pull or Keyring from Plastic Canvas in Youtube. With the 7-mesh plastic canvas, cut a piece 14 holes by 10 holes on each side with a bridge in the middle of 4 holes by 8 holes. Please refer to the above picture as an example of cutting instructions. To make the patchwork effect, you will be dividing the two sides (the 14 hole by 10 hole sides) into 6 section. To do this, you need to stitch using the tent stitch which is also known as the continental stitch around the outside, stitch a horizontal line in the middle, two vertical lines equally spaced apart. Our video on the tent stitch will help if you need instructions on this stitch. Also stitch the bridge area, the small strip between the two sides with the tent stitch. To make the patchwork effect, you will need 6 different colors of yarn. Each space will be filled in with a different color with diagonal lines. To do this, you will use a stitch called the scotch stitch. If you are not familiar with this stitch, our scotch stitch tutorial will be helpful. Finish the edges of the bridge (the piece between the two sections) with an overcast stitch. You can leave your yarn attached after this step and continue to use it for the whip stitch in Step 5. Bend the plastic canvas slightly and insert the ring for key ring or ring with zipper pull so that it is around the bridge area. You will then fold the two sides together, with wrong sides together. Whip stitch around the outside of the project. Our whip stitch tutorial will show you how to make this stitch. After whip stitching the edges, weave your yarn in under the stitches and then cut the yarn. Ta-Da! The patchwork keyring/zipper pull is complete. This is the perfect gift for birthdays, Mother's Day or as a Christmas stocking stuffer. Make them for bazaars or craft tables. 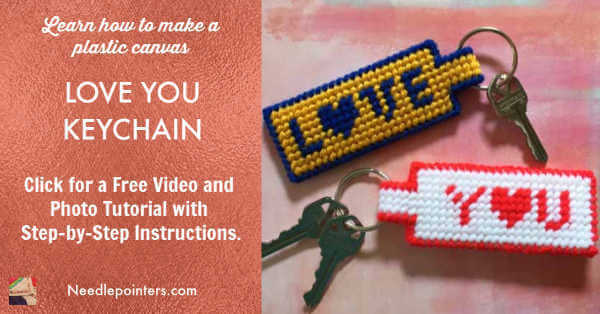 "LOVE YOU" KEY RING TUTORIAL is a fun Valentine's Day project. This would be a great project for your loved ones. This could also be a nice Mother's Day or Father's Day project. 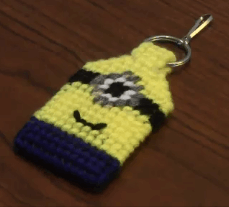 MINION KEYRING is a fun project for all Minion fans out there. It would also make a great zipper pull. 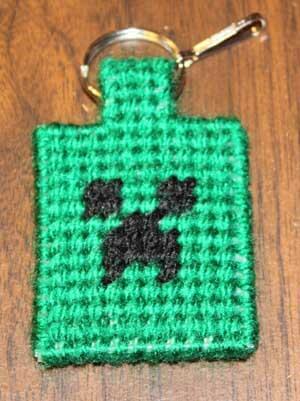 MINECRAFT CREEPER KEY RING is a fun gift for kids who play Minecraft. Lanyard Snap Clip Hooks (Zipper Pulls) 1"